The Italian madrigals published in 1611 were the culmination of Heinrich Schütz’s two years of study with Giovanni Gabrieli in Venice. Other works influenced by his absorption of Venetian music were published later in life, but the op. 1 was the most evident result. Eighteen madrigals are for five voices, the concluding “dialogue” Vasto mar for eight. The “seven voices” of this ensemble’s name actually include nine singers along with three continuo players. Since the madrigals are set for five voices, except the last, which is for eight voices, these numbers are curious. In any case, this version contrasts with that of Hans-Christoph Rademann (Fanfare 35:1) and other recent issues that use multiple voices. In using continuo, it matches Matteo Messori’s harpsichord (30:5), both of these using one voice to a part. 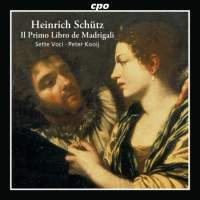 There are only two complete sets of these madrigals using one voice to a part without instruments: the Capella Lipsienis on Berlin Classics (Fanfare LP version in 6:2) and the Consort of Musicke on Deutsche Harmonia Mundi (Fanfare LP version in 10:1, CD version in 10:5), the latter a superb traversal long unavailable domestically but still in print abroad. Today’s competition for this offering is the recent Rademann disc in the planned complete works, even with 18 voices, for his ongoing collection makes it an automatic choice for some. Messori’s version is worthy if you can find it or have it already as part of a set announced optimistically as a complete edition of the composer. All three of these are similar in tempo. Each of these three has something different, but none competes directly with the Consort of Musicke. For the discreet continuo, hardly audible much of the time, and the light, airy voices, this may be the best choice.